Moses: When I say smiling is for the rich, I mean it's for happy people. Ibrahim: You're wrong. Smiling is what makes you happy. Coming-of-age tales are frequently combined with stories of companionship between two individuals of different generations. It's a format that lends itself to interesting material; the elder bestows his/her wise notions on the youngster, giving the other the knowledge of experience. The recent, overlooked Firefly Dreams accomplished this extremely well, not falling into the typical, heavy-handedness that this subgenre can easily wallow in. Monsieur Ibrahimtakes a unique approach to this formula. Moses (Pierre Boulanger) is a young Jewish boy living in Paris during the age of the nouvelle vogue. He claims to be 16, though he does not look it. Using the money from his recently smashed piggy bank, Moses prowls for a prostitute; there are many outside his window, toward which he stares frequently, practicing his pickup lines. This seems to be a common way to begin exploring one's sexuality in France�no one seems to bat an eye. His young craving for love will not stop there. Moses is facing hard times, as usual. His father is a struggling businessman who knows he is not cut out to be a parent. His relationship with his son lies somewhere between a colleague and a father�the latter emerges only out of a weak sense of necessity and obligation. He is clearly uncomfortable with the role. Moses' mother and brother, Paulie, have left them, finding their own life elsewhere. The details of the separation are a mystery, though Moses resents his elder brother with a passion—his father is always comparing him to his other, preferred son. Nearby is an "Arab" grocer, Ibrahim (Omar Sharif). Ibrahim is in fact Turkish, and is a confident, quiet man who places his absolute trust in the Koran. He has watched the young Moses mature, and understands his situation. He even lets him steal from his store. He knows he is in need, and he would rather Moses steal from him than another, less giving shopkeeper. When Moses' father loses his job, beginning a new cycle of loss and abandonment, Ibrahim is aware, though Moses has not revealed his situation. Eventually, through conversation, walks, smiles, and some driving lessons, the two become very close, leading to a journey neither expected. 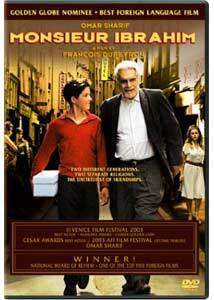 The clear focus of this story is the idea of a deep friendship between a Jewish boy and a Muslim elder, but the film does not make this a large issue. Indeed, the pair realizes the uncommon nature of their relationship, but their individual faiths are part of who they are�identities that have been accepted far before the friendship truly developed. This dimension is not played up, explained or over-emphasized. It simply stands on its own, giving the film a fresh subtlety that avoids preaching. Ibrahim is far more religious than the boy, quoting the Koran and sharing its words with Moses without force. This is an honest, real connection that is well-manifested by Pierre Boulanger and of course, the ever-talented, legendary Omar Sharif. His gentle performance is certainly the highlight. François Dupeyron's direction is impressive, at times taking an almost voyeuristic approach to the visuals. Frequently, we look down on the street from Moses' point of view, or follow characters from behind, giving the audience a sense of direct involvement without truly being placed in their shoes. The photography is free-flowing, handheld, and filled with impressive colors, à la Amélie. Occasionally, the camera eye wanders, capturing small details, helping to create the proper atmosphere. Visually, this is a gorgeous film. However, the script is somewhat thin at times. There are scenes that are hard to swallow, or end rather abruptly, without resolution. Later, the film takes an odd, sudden turn in the form of a road trip to Turkey, making the story feel somewhat unbalanced. Still, the honesty captured between Moses and Ibrahim is real and palpable, succeeding in its overall intent. Image Transfer Review: The anamorphic transfer is slightly windowboxed to accommodate the 1.66:1 image. Detail is good, though the film has a relatively soft appearance throughout. Minor grain persists, giving the image a film-like appearance. There is some edge enhancement from time to time, but overall, a clean, seemingly native NTSC transfer. Audio Transfer Review: The Dolby 5.1 track is well done. Dialogue is clear, and the oldies-heavy soundtrack is crisp, but is mostly front-centered. What's most impressive about this mix is its use of ambiance. Street scenes are very immersive, placing the viewer within the sounds of Paris traffic and pedestrians. There are even some smooth, well-executed directional effects. Later, on approach to Turkey by boat, the gentle sounds of water and a call to prayer fill the soundstage, placing the viewer on in the scene. Extras Review: Aside from the trailers listed above, the only other extra is an audio commentary by Omar Sharif. It's a pleasure to listen to the comments of such a great actor. His contributions revolve around many topics, including his five-year hiatus, youth (and his exploits), the evolution of his character, casting, and more. He is very eloquent, but does pause from time to time. François Dupeyron's tale of true friendship between a Muslim storekeeper and a Jewish boy avoids a heavy-handed tone, but is a bit thin at times. The gentle spirituality of Omar Sharif's performance, coupled with some fine visuals elevate the experience. Columbia's disc is commendable, featuring one quality extra. Recommended.